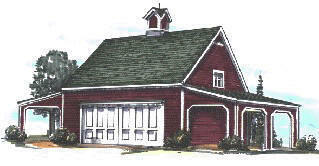 The Pine Car Barn has a 24'x24' two-bay garage at center, with pull-down stairs to a 24'x24' Loft. Two 10'x24' shelters on the sides are for carports or your tractor, boat or motor toys. The garage and loft are each 576 sq. ft. Total carport area is 480 sq. ft.
Plans are $59.00 plus $5.00 for shipping, for three complete sets of drawings. The plans come with a complete money-back guarantee and include a variety of optional add-on sheds, shops, garages and carports that help you build any of seven standard layouts, including the one shown above. All seven of the standard layouts are shown on the plans you'll receive. You can build any of them, or you can use the main building plans and any of the add-ons to create your own custom design.